I love just about any book that teaches good solid content but at the same time makes an extra effort to include something that will draw in our little listeners and keep their attention. 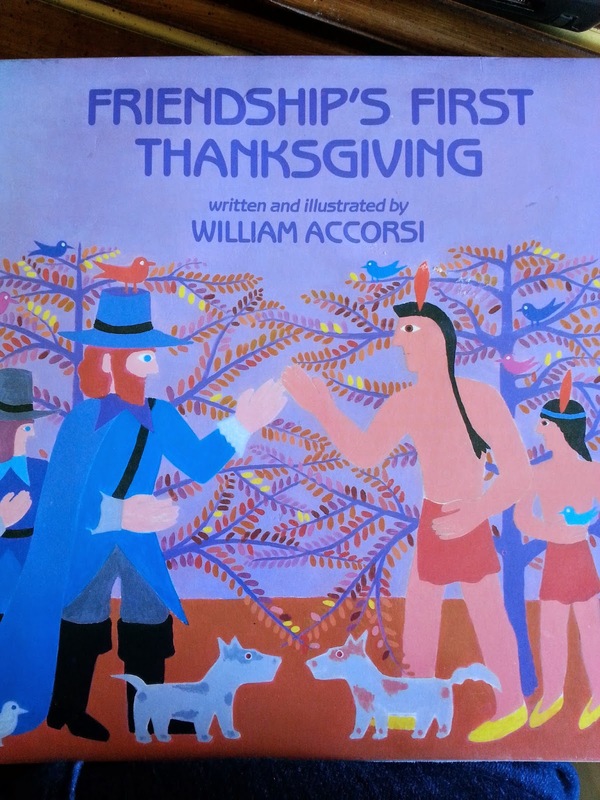 Case in point: Friendship's First Thanksgiving, a book which teaches basic factual info about the Pilgrims' first year in America, with the twist being that the story is told by Friendship, a dog who traveled on the Mayflower. 1. Was there really a dog aboard the Mayflower? Apparently, yes, likely even more than one. A piece written in 1622 relates that a mastiff and a spaniel were present for early exploration during the first winter in New England. 2. Regarding the Indian vs. Native American issue: The author of this book uses the term "Indian". In my materials that you can download below, I use both terms. My take is that it's the author's choice to handle it the way he wants (the book was published in 1992, by the way). I think as teachers of young children, we can explain to our students that sometimes they may read or hear of the word Indians being used instead of Native Americans. It even makes sense to use a globe to explain the geographic reason for this misnaming. However, according to infoplease.com, "the majority of American Indians/Native Americans believe it is acceptable to use either term, or both." Bottom line: I don't mean to ruffle any feathers with this, and apologize in advance if I inadvertently have done so. So, on to the book, and some ideas for using it with your class. In addition to being a great review of facts about Thanksgiving, this story is a wonderful way to introduce point of view, for both reading and writing. After reading the book once, read it again and have your students listen for specific examples that show that these are the thoughts/words of a dog. Raising their hands when they identify these parts is one way to go, but the added fun of a special signal tends to keep little ones listening more carefully. "Puppy paws begging"? Panting tongues? You know your own class and how far you can push the envelope without sending them over the added-too-much-fun edge. :) For point of view in writing, have your students write a few sentences from the point of view of an adult or child Pilgrim or Native American. Then let volunteers read theirs to the class. If the class can tell who is speaking, the author's job has ben done well! This writing project would be a great fit for working with an older Buddy Class. Art discussion: Accorsi, who has created his own illustrations for his text, identifies himself as a "realist" who uses artistic license to create stylized characters. Have your students point out examples of this in the book, and then find other examples of artistic license in books in your classroom. At the end of the book, the author provides some interesting footnotes to the story. Do not miss turning to the very, very last page of the book (like I did the first few times I read it!). You and your students will be charmed when you read "the rest of the story" about Friendship! Here's a little packet of reading, writing, and math extensions that I hope you'll enjoy using after you read Friendship's First Thanksgiving. Just click on the image to download it from Google Drive. By the way, the adorable pup in this packet is from Kari Bolt and the sweet turkey is from LitaLita, both talented artists at TpT. I hope you'll also stop by my Primary Inspiration blog this week, where I'll be talking about some of my other favorite books for Thanksgiving. Have a wonderful November, and a Thanksgiving Day filled with the blessings of loving family, good health, and gratitude!